Over the years, Science has struggled to explore modern operational techniques for two basic reasons. Firstly, to diminish the use of invasive methods and secondly, to make an operation more efficient. This evolution has brought about some incredible inventions and the laparoscopic procedure is one of them. Typically, a laparoscope is designed to get inside the body (very precisely) and stream the affected area on the screen of doctors. It provides them a great edge to perform the surgery very precisely with least invasion and utmost efficiency. Talking specifically about an incisional hernia, it is a condition in which the patient develops a bulge due to a maltreatment of his previous surgery. Just to simplify, it occurs when you do not take care of your previous surgery and it turns out to be an ever serious one, mainly due to the excessive tension on your tissue and muscle walls. It may develop over years or within a few week after your surgery, due to any rough movements and pressure. The repair of an incisional hernia is quite efficiently performed with laparoscopy where the doctor inserts a laparoscope inside your body and performs a brief surgery with the help of video cameras. If you would like to know more about this procedure, Click Here to schedule a Free consultation with Dr. Roohipour to discuss your options. 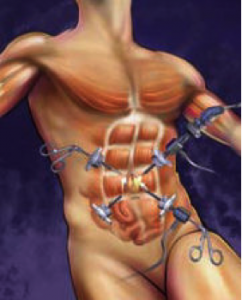 The scope of a laparoscopic procedure depends on the sophistication and adversity of your hernia and in bulky cases, it may lead to the creation of abdominal muscle flaps and using of huge mesh. It has a number of advantages and all of them are mainly for the benefit of patient. If you are treated under a laparoscope, your expected time of recovery is diminished to a great extent and that is because the doctors do not have to cut you excessively. They just cut your skin from very well-defined spots and the aim is not to make their work easier, but to aggravate your recovery process once the surgery is over. Since it is least invasive, you do not have to stay in the sophisticated hospital environment for long because the recovery is very rapid. In some of the cases, the patient is released within 24 hours after the procedure. The laparoscopic repair of hernia decreases the post-surgery discomfort as well, which is not otherwise achievable in the traditionally invasive methods of treatment. Although you are advised to continue or initiate with an array of medications and changes in lifestyle, in order to gear up the rate of your recovery, but the recurrence factor or rather risks factor after each surgery is still there. The only way to prevent the recurrence is to use a mesh that decreases the recurrence risk by more than 50%. 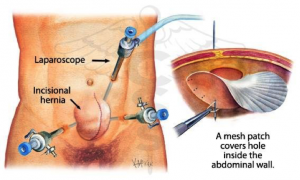 Initially, there were some limitations in laparoscopy where the doctors could not put their hands in the abdomen to treat a condition, particularly when it came to the pancreas and bile duct, but now even this issue has been resolved and the latest laparoscopy allows a doctor to insert his hand inside the abdomen in order to deal with a hernia, as required in some of the cases. Disclaimer: Information provided in this article is for general knowledge purposes only. It is, in no means, a replacement for your doctor’s advice. Please consult your doctor and surgeon with your particular case for effective treatment and recovery of your condition. 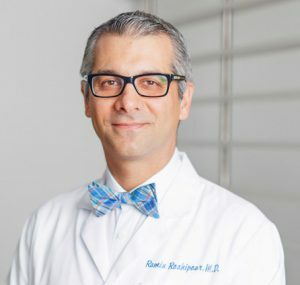 Fill in the form below or call (310) 326-3062 to schedule your consultation with Dr. Roohipour.